IoT will enable the company to launch offerings where products and services are packaged in new ways, e.g. "product as a service"
Are you excited about your progress in capitalizing on remote services and operational data? Do you know how much you can earn on Internet of Things (IoT) and where the money will come from? Have you addressed your best opportunity? Are you connecting enough customer equipment per year? Are you selling more products and services to connected Customer? Is your delivery to connected Customers more efficient? Have you captured data to improve next generation products? Have you developed new, exciting offers that have taken market shares? The Internet of Things provides you with an opportunity to earn money on retrieved equipment operational data and remote services enabled by connected, intelligent products. Suppose that, in a couple of years, you have launched an extremely exciting and unique offering leveraging operational data and remote services, which creates more value for customers and dramatically increases your market share. Imagine that you have a large portion of your customers sharing operational data with you, making your application expertise stronger than your customers’ and competitors’ expertise. Imagine that you have equipment health statistics, making it possible to predict break-downs and guarantee functionality. Imagine that you have dramatically increased operational efficiency in delivered projects and services. How would such an achievement improve your business? This will become a reality in your industry, it is just a matter of who will be the first mover. The way you can get there is by having your business opportunities lead the development of your IoT solution. It is a journey similar to learning to crawl, before walking, before running. Many aim for predictive, or condition-based maintenance as one of the main targets for their IoT development, and that require Big Data. In the Big Data stage of the IoT journey a large amount of Customers’ equipment are connected and You are retrieving and analysing data providing the statistical evidence You need. However, in the early stages of the IoT journey, what we call the “One-to-One” stage, it is important that you first of all have a strong message to all Customers making them willing to connect their equipment and share data. For each new connected equipment, you can explore opportunities to sell more (spares, wears, consumables, service contracts, remote monitoring and optimization services …) and increase internal efficiency in your delivery (remote maintenance, call qualification, remote planning and commissioning …). Smartly approached each new connected Customer represent additional earnings. Offering benchmarking services so Customers understand that they can improve their usage of their equipment and help them improve. Launch of new exiting offerings to the market, which are unique and makes Customers able to increase or improve their value creation. How long time will it take before you are able to explore the Big Data benefits? You need to establish your IoT vision. What do you want to achieve with IoT long term? What kind of earnings do you see that IoT will bring you, both short term and long term? How should you prioritize IoT development vs other initiatives in the company? IoT is a multi-stakeholder solution where many internal and external stakeholders have different remote services and information needs. If all these requirements are collected, you will have a telephone book-sized specification and it will take ages before it is designed, developed, launched and implemented. On the other hand, without understanding your stakeholder needs and potential contributions, how can you decide on how to proceed? One of your key challenges is to find the best step-by-step way forward, where each step addresses a distinct opportunity and delivers real, verified business impact. Our experience shows that determining the scope of IoT development steps is very complicated. Without an overall map, it is very difficult to decide on the scope of the next step. If the scope, which is defined by stakeholder requirements and product range, is too big, development and implementation can become too complex, resulting in long lead time (can be many years). On the other hand, if the scope is too small, the financial impact can be limited. When specifying and designing a solution for any business-driven IoT development, five parts need to be considered. The data solution is where equipment data is defined, aligned, stored and accessed. 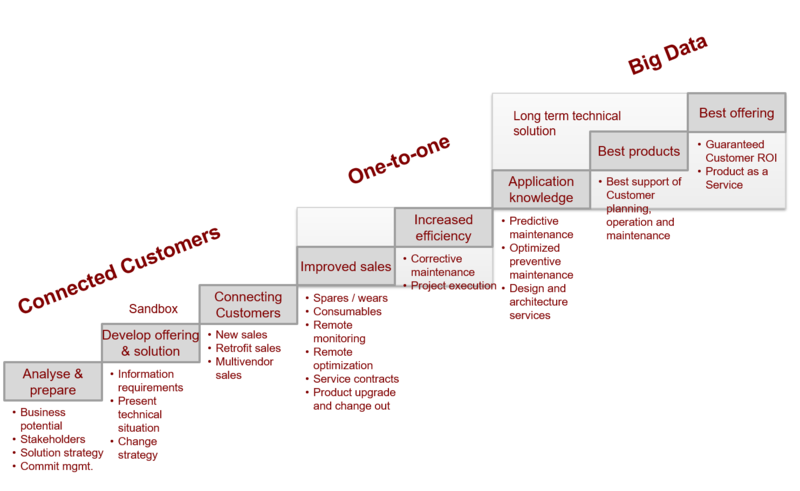 The process solution describes new ways of working as a result of IoT. The organisational solution defines organisational and role changes. The technical solution involves data capture and remote capabilities of the specific product range, connectivity and central applications for handling data and supporting remote services. These four solutions enable the services solution, holding the IoT services where earnings actually are made, all driven by the stakeholders needs. The complexity in developing IoT solutions can become overwhelming. You have to solve questions like: What is the business potential for us and who are the main contributors? How do you convince customers to share data? What information should be retrieved from the product/solution? How do you choose the next step to develop? What is required by the new business models? What new remote services can be sold and delivered? How can IoT increase spare part sales? What do you need to do to launch predictive maintenance solutions? How do you map data definitions between products and IT? How do you manage a solution built by R&D and IT? 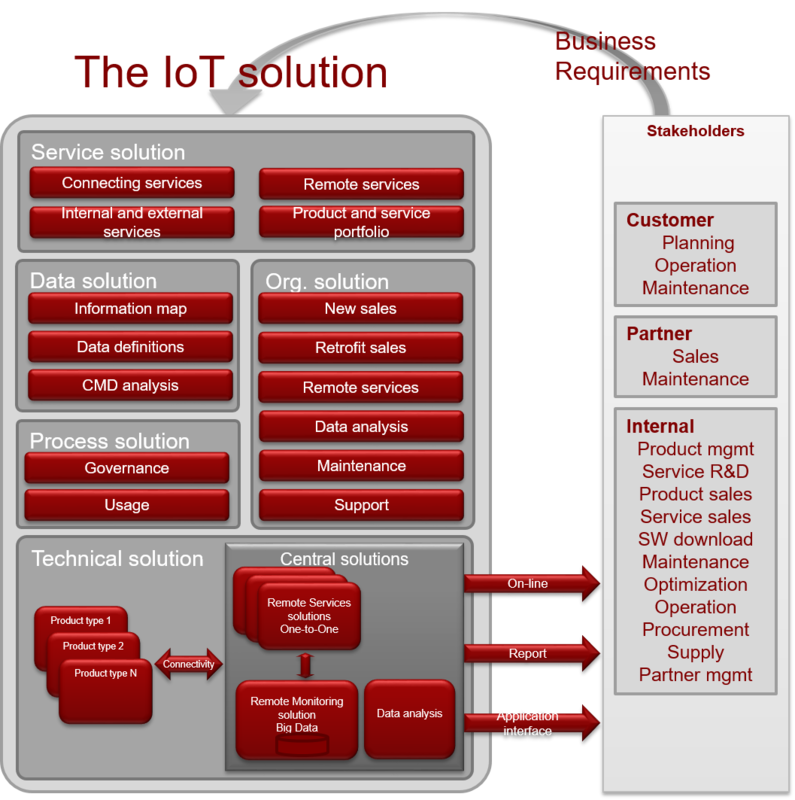 How do you know what to buy and what to make from the IoT solution? What vendors do you choose? How do you measure success? How should IoT be owned and continuously improved? When beginning a business driven IoT evolution, the focus is on convincing customers to connect. After that, the focus turns to serving internal and external stakeholders, and finally new offerings and business models based on “big data” become the most essential. If you are just getting started or not totally satisfied with your progress so far, we can support you in more quickly and optimally leveraging IoT. If you want to define your Internet of Things vision and strategies, we recommend your best IoT approach and potential business improvements, the major contributors to lifting the business, the major changes needed to the company, and a step-by-step road map to reaching this wanted position. There are so many IoT opportunities and the question is how to address the best one? If you want to increase the speed in your IoT development, we can guarantee the financial impact of your next IoT development step by managing the scoping, design, development and implementation. The scope will be defined to maximize business impact within minimal time, benefitting from your existing development and analysis, to lead towards your IoT vision. If you want more customers to connect, we have the recipe based on what we call “Connecting Services” and therefore we can guarantee a dramatic increase. If you want to sell more products, services or spare/wear parts, we can guarantee business growth by designing and implementing offerings that will support product sales and service sales staff in a better way, based on IoT information. If you want to increase internal efficiency, we can guarantee increased efficiency based on the best way to centralize activities into dedicated, specialized remote service centres and/or to provide information services derived from mined data to support your staff. If you want to improve your competitiveness, we can recommend and design your best company offering by leveraging remote services and collected operational data, and define how to implement these in the fastest way. If you want to manage IoT development yourself, we are happy to share our knowledge with you in the specific area that you need, to help you achieve more success faster. There are many areas where we can help improve the solution and avoid bumps along the way. All our assignments are joint initiatives between your in-house industry experts and our IoT hands-on expertise in designing and implementing tailored IoT solutions. Our core competence is IoT AND service business development. We have managed development, implementation and verification of IoT results in our previous line roles. We have consolidated our IoT experience into end state models, key success factors and methodology benefitting our customers. We have experience from large transformations in matrix organisations. We are business focused and can guarantee results. IoT is a journey and if you are not traveling fast, exploring and learning, you risk competitors launching their “landmark event” offering before you do.